Read a little further and I'll share all the deets (and links)! The Happy Planner® Storage Case - This little case holds WAY more than you'd expect. There are pockets and pouches galore! Perfect for on-the-go planning...even if that is just from room to room in your house. THIS is my daily planner, available at Staples. I love the neutral layout and I just upgraded to the Rose Gold Classic Metal Discs. The perfect tool for tearing washi and drawing lines is this Pacific Arc 6 inch ruler that fits perfectly in my favorite pen pouch (see #11). I've been crushing my health and fitness goals using the Wellness Extension Pack! Seriously, right now, this is my #2 must-have...aside from stickers, obvi! Adding items to my planners is super easy with The Happy Planner® BIG paper punch. I like the BIG one because it works for all 3 planner sizes. The Fiskars 12 inch paper trimmer is just an all-around great tool to have around. It's lightweight and there's a wire that shows where the blade will cut. Love it! I often get asked what kind of pen I use to write my daily tasks. Honestly, the pen I love the most is the Uniball Roller Pen, Micro Point in black. I love the way it writes and it's micro point is perfect for fitting a lot of items in my weekly columns. We recently released new metal discs and I'm in LOVE! They come in 5 different colors and each color is available in all three sizes. These teal discs are beautiful! I created my 2017 Happy Memory Keeping™ planner in True Story and my 2018 choice is the BEAUTIFUL Rustic planner. You REALLY should see the inside of this special planner. Subtle beauty at it's finest...I'll add the link once it's live on our shop today at 12:00 pm. The accessory pouch with an elastic band has been in my top 3 since it was launched. It holds my pens, washi tape, adhesive, ruler and can even fit my phone. The elastic band holds my planner closed and secures the pouch so it makes it easy to carry around without dropping anything. The Tombow Twintone markers are out of this world awesome! The colors are gorgeous and the dual tips are the perfect sizes for my Happy Planner®! No planner (or craft) bag is complete without an X-ACTO knife and THIS ONE is my fave! Is there such thing as a perfect adhesive applicator? In my opinion, YES! The Tombow MONO permanent adhesive applicator is it! It's almost TOO easy to refill. I wasn't sure that I was doing it right...but I was. The only adhesive I use in my Memory Planner! Zebra Mildliners are WAY more than just a highlighter...they call them creative markers. The colors are dreamy! I have 3 sets so my offices at home and work can have their own. What's the third set for? For planning on the go...in my accessory pouch. Obsess much Stephanie? I guess I didn't really pay attention because I included these in #9. Oops! 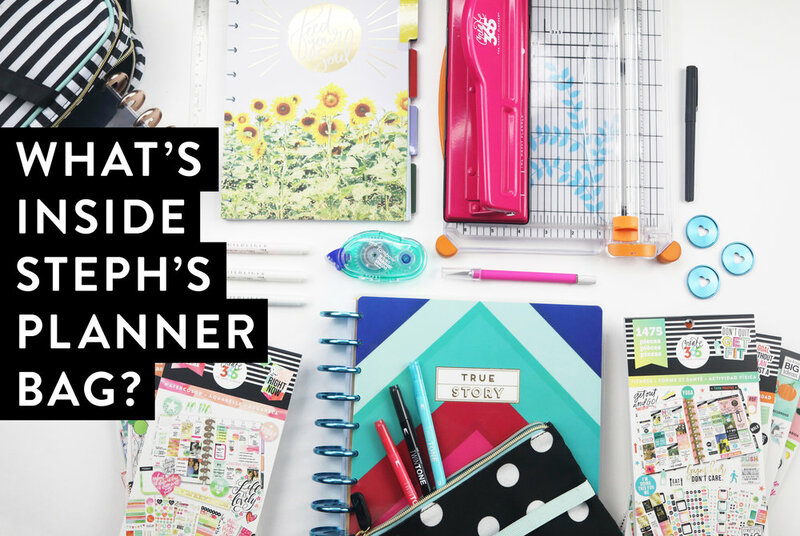 What are some of your All Star Happy Planner® products? WHAT'S IN HANNAH'S PLANNER BAG?